Or, how the Safe Following Distance becomes the Stopping Distance. In normal and dry conditions a driver should keep 2 to 3 seconds distance from the vehicle in front. In wet or slippery conditions a driver should keep 4 to 5 seconds distance from the vehicle in front. When stopped, a driver should be able to see the bottoms of the tyres of the vehicle in front. To ensure 2 to 3 seconds of distance while moving, watch the car in front pass an object by the side of the road. Count to 2 or 3 and ensure you do not pass that object until 2 to 3 seconds have elapsed. (Tip: Remember to include the last second.) Gently slow to reduce the speed by 5 km/h and count again until you reach the safe distance. If you just counted 2 to 3 entire seconds in your head and it seems like an overly long time, then read on and you’ll understand why this is important, and how the Safe Following Distance becomes the Stopping Distance in an emergency. In case of a rear-end collision, a driver has a chance of not being pushed into the vehicle in front. A manual vehicle in front may also move backwards on an upwards incline before it goes into gear (or your vehicle may move forward on a downwards incline). You can easily go around a vehicle in case of a breakdown. It is also a good idea to keep the tyres pointed straight when stopped in moving traffic so that a push from behind does not cause the vehicle to move into another lane. Note also that a driver should also check their rear-view mirror before slowing, even more so when braking hard, to ensure coming to a quick stop is safer than steering around a hazard. A close-following vehicle behind may be a danger during a quick stop. An average alert human concentrating on their driving requires 1.5 seconds to recognise a road hazard and begin the physical process of braking. The Perception distance (distance travelled while recognising a hazard). The Reaction distance (taking action, such as moving the foot onto the brake pedal and pushing). Braking distance (the vehicle’s ability to come to a stop). Total stopping distance (the sum of the above three components). 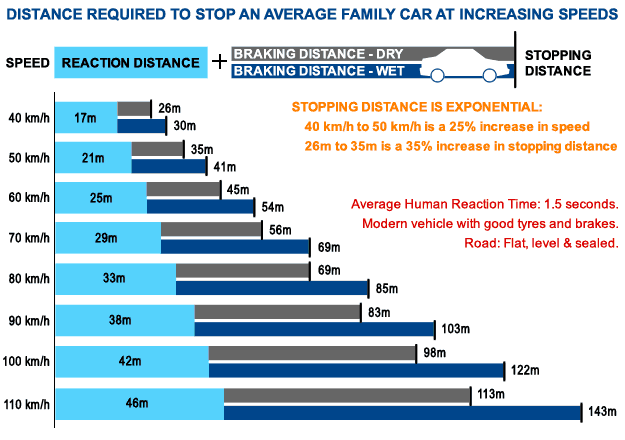 If we look at each component, it is easy to see how the Total Stopping Distance can greatly enlarge. Tiredness/fatigue (including time of day). Stress levels (work and personal problems). Distractions (music/radio, phone calls, signs). Vision (sun glare, eyesight impairment, night time). A perfect driver would be fresh and alert, with no alcohol, drugs and medication in their system, no work or personal problems or tasks on their mind, no distractions in or outside the car and perfect vision. But we are all different, and we all share the road together. Do the tyres have sufficient tread and grip? A vehicle’s speed and weight can change dramatically on each drive. The environment can change dramatically also. A portion of the stopping time is waiting for the brake system to become more effective. As the speed of the vehicle reduces during braking, the brakes become more effective because there is less and less speed to arrest as time elapses. As the speed drops off, the brakes slow the car at a faster rate. 50 km/h is only 10 km/h more than 40 km/h (a 25% increase in speed). It takes 35 metres to stop the vehicle from 50 km/h, as opposed to 26 metres from 40 km/h (a 35% increase in in stopping distance). This is because there is a longer period required for the brake system to become more effective against the higher speed, as well as more speed overall. As mentioned earlier, the speed may increase but the vehicle’s brake system remains the same, and brakes require an amount of time to first become properly effective in slowing a vehicle. Only the most expensive, high-performance brake systems are designed to be more effective at higher speeds. When braking, the front tyres “dig in” to the road as the load is shifted to the front of the vehicle. Tyres have tread on their surface which allow the tyre to travel over different types of surfaces and maintain grip (not just smooth road). If a tyre is worn down, the surface may be flat or have almost no tread lines, and is dangerous not only in wet conditions. If there is gravel, water, oil or other things of concern on the road, such as snow or ice, the braking performance will be significantly degraded by worn tyres and the vehicle may slide in a loss of control situation, even if the wheels have come to a stop. The tyres don’t have enough grip to stop the vehicle safely. Greater care must be taken when cornering, as tyres can lose grip at lower speeds. Doubling the Safe Following Distance is recommended as it can take longer to slow a vehicle on wet or slippery surfaces. Perform gentler lane-changing manoeuvres in wet or slippery conditions, especially at higher speeds. Road surfaces and signs can become more reflective and visually distracting during these conditions, so more concentration may be required. No matter how much care one takes during driving, there are always some drivers who choose to follow too closely behind others. There may be a valid reason for the other driver needing to go past such as a family medical emergency. In many cases drivers who tailgate have often developed a bad habit and become complacent with their driving skills and maintaining a Safe Following Distance. Generally, the rule is to keep left unless overtaking, but there may be reasons you are in the right lane, such as an upcoming turn off or there may be upcoming parked vehicles on the left lane. Try your best not to become agitated. Do not slow down or “play games” with the other driver. Do not feel pressured to take risk and speed up. Change lanes when safe to do so, allowing the other driver to pass.